Ashley Greene speaks during the “NO MORE” Domestic Violence Awareness Launch Event in 2013 at the Dirksen Senate Office Building in Washington, DC. The bottom line is this: Married women are notably safer than their unmarried peers, and girls raised in a home with their married father are markedly less likely to be abused or assaulted than children living without their own father. In addition to the headline, the article itself was problematic, seeming to imply the responsibility for addressing domestic violence lies with its victims. But the way the authors presented the data to support their claims was also flawed, according to the author of the underlying study. Two problems stood out immediately. The op-ed focused on marriage, but marriage isn’t the only thing that could affect intimate partner violence. There could be other factors at play. Intimate violence rates are lower among married women, but we can’t rule out the possibility of confounding variables. To put the point more plainly: “the marrying kind tend to be more educated, wealthier and whiter,” so the focus on marriage should come with some exploration of the fact that education, income and race could also partly explain trends in intimate violence. One of the charts used in the article (seen at left) comes from a Department of Justice study published in 2012. I got in touch with the study’s author, Shannon Catalano, a statistician at the Bureau of Justice Statistics, who said her chart was presented without sufficient context. The BJS chart used here is limited to one variable, household composition, when we know from previous research that violence is associated with a multitude of factors. Though other researchers have examined these factors, the purpose of the BJS report was not to identify these other factors. 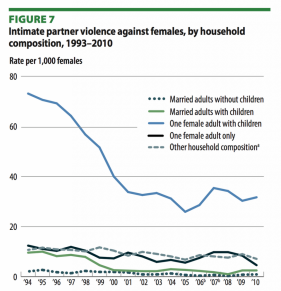 The graph which they used from my report does show clear differences between intimate violence rates — but that is because it is only showing one variable; household composition. The story could change if we started to control for other factors. We know, for example, that victimization (for several types of violence including intimate partner violence) is much higher for younger males and females, particularly between the ages of 18-24. The trends may change when other factors are taken into consideration. There are various other factors besides marriage that may account for differential victimization rates. Finally, the Post’s op-ed used data from the Bureau of Justice Statistics’ National Crime Victimization Survey (NCVS). That’s survey-data. As noted above, not all women are equally likely to report violence. And of all personal victimization crimes women reported in the NCVS between 1993 and 2012, only 50 percent were also reported to the police. We don’t know if married women are more or less likely to report to the Bureau of Justice Statistics that they are being victimized by an intimate partner than unmarried women. The op-ed never addresses the fact that relationship status could affect reporting rates — and therefore the reliability of the authors’ conclusions.